NORTH KOREA HAS said the US was acting with “alarming” impatience on the issue of denuclearisation, after Secretary of State Mike Pompeo stressed the need to maintain full sanctions pressure on Pyongyang. At historic talks with President Donald Trump in June, North Korea’s leader Kim Jong Un signed up to a vague commitment to “denuclearisation of the Korean Peninsula” – a far cry from long-standing US demands for complete, verifiable and irreversible disarmament. At the ASEAN Regional Forum, North Korea’s Foreign Minister Ri Yong Ho criticised US impatience on denuclearisation. “What is alarming, however, is the insistent moves manifested within the US to go back to the old, far from its leader’s intention,” he said, according to a statement. 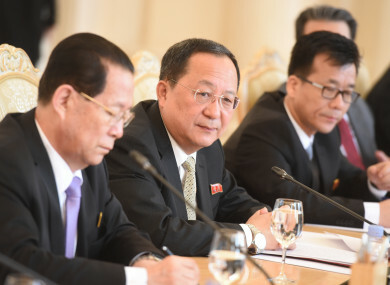 Since the June agreement, Pyongyang had taken “goodwill measures”, including a halt on nuclear and missile tests and “dismantling a nuclear test ground”, he said. Earlier at the same forum, Pompeo said he was emphasizing “the importance of maintaining diplomatic and economic pressure on North Korea” but also said that he was “optimistic” about the prospects for progress when it came to North Korean denuclearisation. At today’s meeting, the US delegation also delivered a letter from Trump intended for Kim, by passing it to Ri, said the State Department. Today’s forum, hosted by the Association of Southeast Asian Nations (ASEAN), brings together top diplomats from 26 countries and the European Union for talks on political and security issues in the Asia-Pacific. Email “North Korea criticises US for acting with 'alarming' impatience on denuclearisation issue”. Feedback on “North Korea criticises US for acting with 'alarming' impatience on denuclearisation issue”.